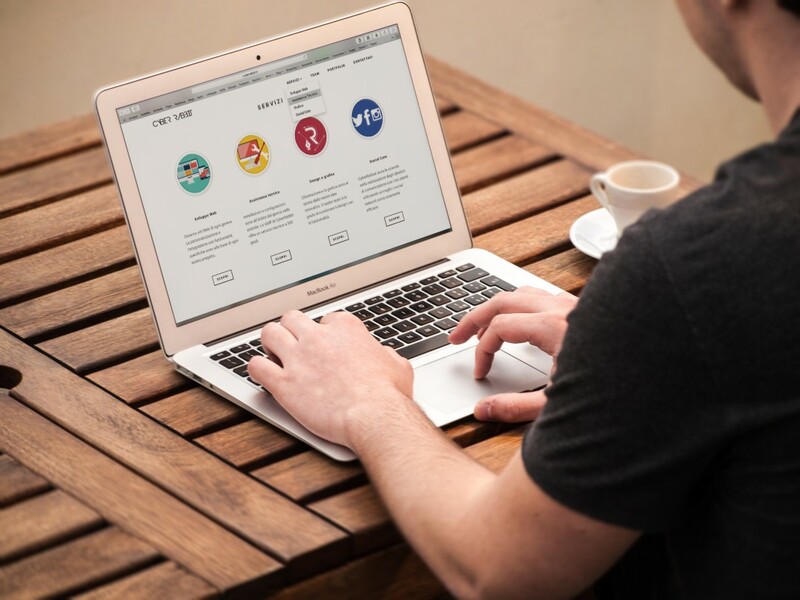 A GoDaddy survey revealed that 83 percent of SMEs that have a website feel they have a competitive advantage over those that do not have a website. To learn how to create a professional website for your company and outperform your competitors, you’ll need the right tools to do so. You’ll also need to know how to structure it, what content to feature to achieve your goals and how to get more visibility in search engines. As recent as a few years ago, creating a simple web page with minimal visual quality, varied content and solid navigation was considered complicated and laborious. Today, there are some tools that make the task easier and save time and development costs. Code it from scratch: You can create your website by writing the code from scratch using a text editor. You need programming knowledge and a lot of patience since this can take you months to complete. If you really want to have a website made from scratch but don’t have the personal experience, you can hire a programmer to do the job for you. Use a platform to create your website (CMS): There are some platforms, also known as CMSs (Content Management Systems), that let you create a website in two days without worrying about knowing how to code. Platforms including WordPress, Wix, and Squarespace not only allow you to save time and costs when building your website but also greatly facilitate the management including updating your content. If going the CMS route, you have to choose the platform that has the right features to best suit your needs. WordPress: This is the most popular CMS and the one that offers the most customization features. A study of W3Techs found that it currently has a market share of 59.8 percent compared to other CMSs and it’s used in 31.1 percent of the whole world’s websites. It’s more than likely that you’ve navigated several websites created with WordPress. For example, well-known blogs like TechCrunch and Mashable were made with this platform. The WordPress software itself is free but it will cost you money for a website domain and external hosting. An optional cost can be a theme or web template. There are many free WordPress themes, but the paid ones tend to have more colorful designs and professional finishes, as well as support options. Another additional option is paid plugins. Plugins are tools that allow you to extend WordPress features, such as adding advanced forms or buttons to share your web pages on social media. There are free plugins that can be useful, so paying for a plugin is not always necessary. Finally, if you want to integrate a blog into your website, this is the best platform to do so. 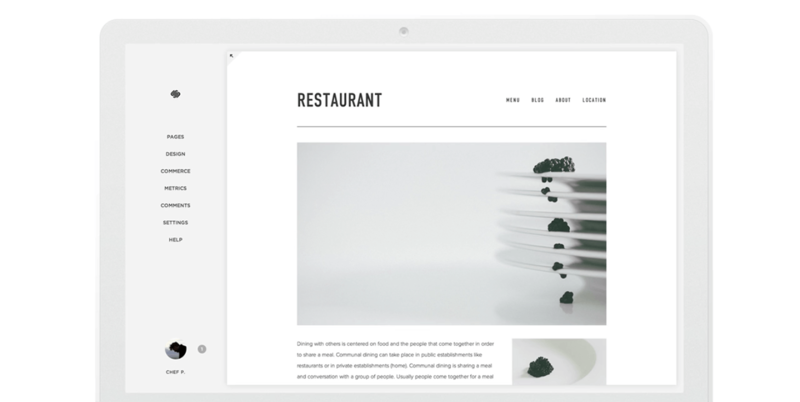 Squarespace: This is another platform that is becoming increasingly popular. According to W3Techs, it’s currently used by 2.3 percent of websites that use a CMS. It’s designed for beginners and when compared to WordPress it’s easier to use. However, it loses in terms of flexibility and functionality. Unlike WordPress, with Squarespace, it’s not necessary to register a domain, find external hosting, worry about maintenance, updates or adaptability to mobile screens (their templates are all responsive). Here, you just need to register on the platform, choose a template and answer some simple questions (something that can be done in a few minutes). Then, you just have to modify the text and the images of the template. There is a fee to use it, starting at $96 a year for the simplest plan. Although Squarespace supports e-commerce, if you are considering creating an e-commerce site, it’s not the best option. The platform offered for this is quite limited and if you don’t buy one of their most expensive plans, you will have to pay the platform a fee of 2-3 percent of your commission of every credit card transaction made by your clients. Wix: You may have watched a Wix ad on YouTube more than once. Lately, this company is betting heavily on video marketing. According to W3Techs, currently, 1.5 percent of the websites using a CMS are using Wix which represents 0.8 percent of all the websites in the world. 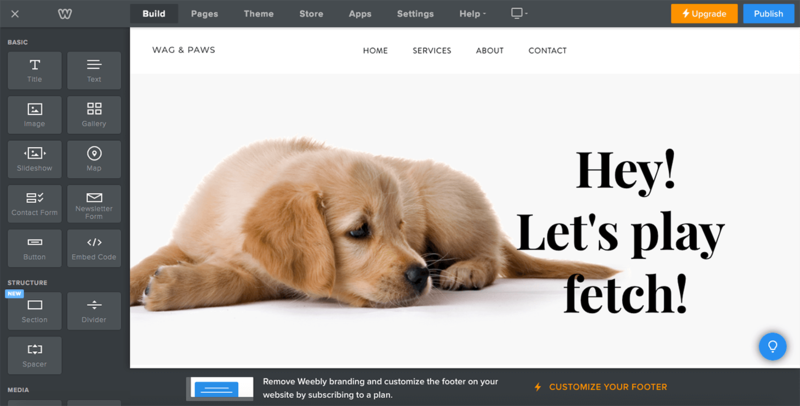 Like Squarespace, Wix offers a more intuitive and easier to use platform than WordPress and doesn’t require you to buy a domain name or pay for external hosting. Its strong points with respect to Squarespace are that it offers a lot more variety of templates (although not of higher quality) designed for all types of industries, its plans are more economical, its e-commerce functionalities are a bit better and it’s more efficient in SEO (can help you get better positions in Google). However, unlike Squarespace and WordPress, it’s not possible to change the template with Wix once you have chosen one, so you should think it over very well. Keep in mind that their templates are not responsive and you will have to dedicate additional time to create the mobile version of your website, something you don’t need to worry about with Squarespace or WordPress. Weebly: According to W3Techs, Weebly is used by 0.6 percent of all the websites that use a CMS which represents 0.3 percent of all the websites in the world. Compared with Squarespace, Weebly’s platform is a bit more intuitive and offers more customization and design options, but it’s not as flexible as Wix. The number of web templates to choose from is a little smaller than that of Squarespace, but the styles are more varied. 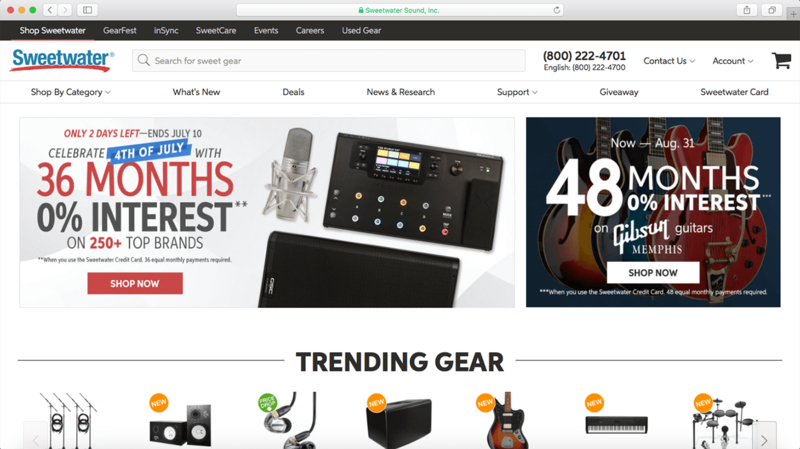 All its templates are responsive, just like Squarespace’s and its tool to build an e-commerce site is a bit more complete than Squarespace’s. As for the price of Weebly, it’s very similar to Wix, therefore, cheaper than Squarespace. Weebly also provides hosting and allows you to create a domain from the platform itself just by registering. 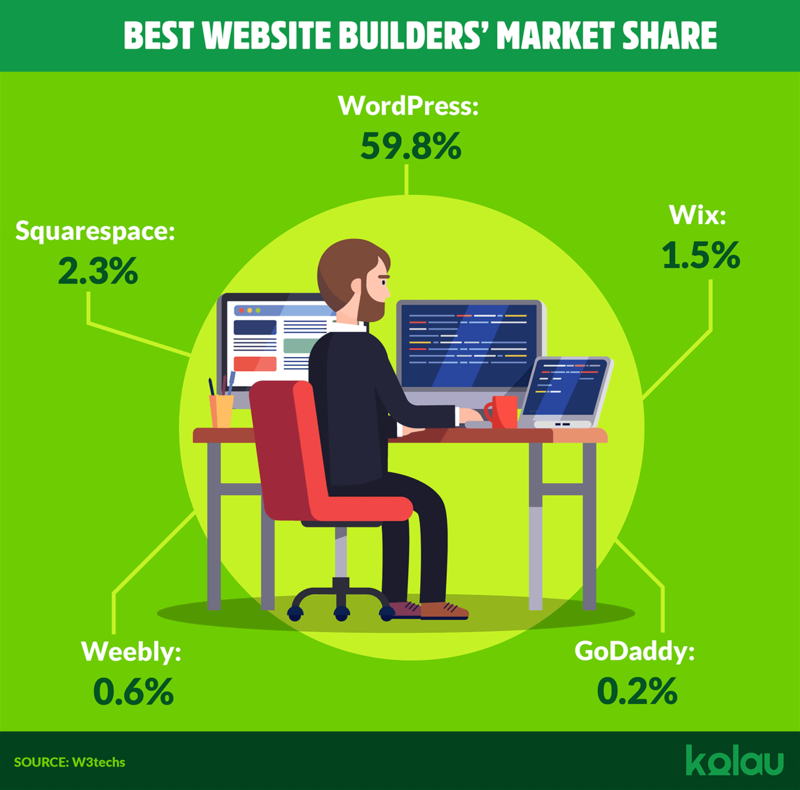 GoDaddy Website Builder: According to W3Techs, GoDaddy Website Builder is used by 0.2 percent of all the websites that use a CMS which represents 0.1 percent of all the websites in the world. If you’re looking to create a basic website as quickly as possible and at the lowest price, this is the most appropriate platform. It is the cheapest and simplest option, although its design and customization options are the most limited. Its templates adapt to mobile screens like Squarespace and Weebly and also allows for the creation of an e-commerce site although with scarce options. GoDaddy is actually a domain provider that created a platform to build websites (GoDaddy Website Builder), so if you already have a domain contracted through GoDaddy, it is extremely easy to connect it with their platform. Like Squarespace, Wix, and Weebly, GoDaddy also offers a hosting service. It is essential that your website has a mobile version or that it adapts to the screen of mobile devices, which is known as “responsive design.” Although most of the templates from the aforementioned platforms are already responsive or allow you to create a version of your website for mobile devices, it’s important to make sure of it. Mobile is no longer an option, it’s a need. Globally, web traffic through smartphones already accounts for more than half of the total traffic. Nowadays, people expect to receive answers instantly to make decisions, learn new things or fulfill wishes, and they use the device they have closest to achieve it. According to Google data, almost 40 percent of people conduct searches only through their smartphones during the day to meet immediate needs. This data makes clear that the penetration of mobile devices has changed the way people interact with the world and that you will be missing the opportunity to reach many more users if your website isn’t responsive. There are some regions where browsing the Internet through mobile devices far exceeds navigation through computers. 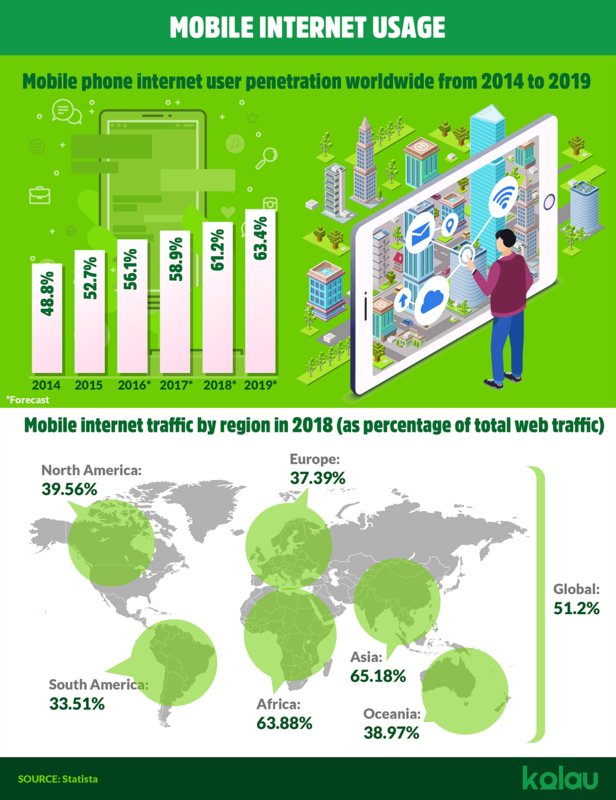 According to data from Statista, mobile web traffic in Asia accounts for 65.18 percent of total traffic while it represents 63.88 percent of all web traffic in Africa. According to Google, there are also some topics that are searched more often through smartphones. For example, everything to do with health and diseases, the upbringing of a child or beauty (especially nail and hair care) seem to be more researched via mobile devices. Your company may not be operating in any of the given regions or your content may not match the ones mentioned, but that doesn’t mean you don’t need a responsive website. Since 2015, Google penalizes websites that are not responsive. If you don’t have a website that adapts to the screens of different mobile devices, your positioning will be negatively affected and you will lose the opportunity to gain visibility through both smartphones and computers. Add a clickable phone: According to an investigation about customer service carried out by NewVoiceMedia, 75 percent of people think that calling is the most effective way to get a quick response. Therefore, offering users the ability to call your company from your website is essential to establish contact with your customers. Since navigation through smartphones is increasingly frequent, making it possible for users to call you with a single click can create more sales opportunities. Make sure that the phone numbers on your website are clickable and that your company has the capacity to handle calls. 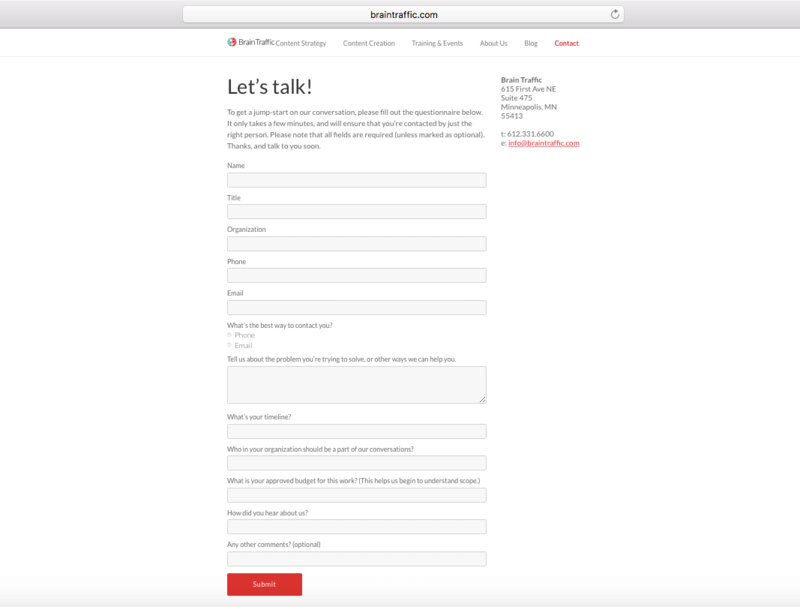 Add a simple contact form: You should avoid long forms. Ask only for data that is strictly necessary for users to contact you: a field for their name, one for their email address, one for the subject and another for the message. Do not ask for their phone number if it’s not necessary. According to Outbounce, this field reduces the conversion rate of your form by 5 percent. At a glance, it looks too long and time-consuming to fill out. According to Outbounce, reducing a form’s fields from 11 to 4 can increase conversions up to 120 percent. So, if you want to get conversions, make a simple form. Keep in mind that if you sell products or offer services to the European Union, you must add some more elements to your form to comply with the new Data Protection Law (GDPR). Remember to also add a clickable phone number on the contact page. If you own a services company, create a page for each service following a landing page style: When adding the services offered by your company on your website, do not include them all in a single page. Create a different page for each type of service and ensure that its design resembles that of a landing page (a separate page that is normally used in online advertising campaigns with the aim of achieving a specific action by the user, such as registration, a reservation or the request of an estimate). To create your service pages, include a visible form on the right that allows users to contact you at any time. The text of the page should be concise and relevant. You should be able to explain in the fewest possible words what service you offer and what benefits it provides, focusing especially on the second item. Also, add images or videos whenever possible. If you have testimonials or customer reviews make sure to include them. According to Social Fresh, customer testimonials are the most effective type of content with an 89 percent rating in terms of effectiveness. If you sell products, make it clear to users why they should buy from your store and not Amazon or anywhere else: The competition in the e-commerce sector is fierce and beating giants like Amazon are not easy unless you sell a unique product. To have any chance of beating these giants, it’s important to indicate in a visible way at the top of your page what a user gains by buying your products (it should be something that can’t be obtained through Amazon). For example, Fnac, a French store of technological and cultural products, mentions different offers or exclusive benefits that users can get if they buy their albums through their music page, including tickets for the premiere of the musical Mamma Mia!, a 5 percent discount on books, tickets for music festivals, etc. Create a unique title and description for each page: To achieve a good positioning in the organic results of search engines you must ensure that each page has a unique title and description. When optimizing the SEO of your website, there are two types of strategies within it. On the one hand, on-page SEO takes into account the elements of your website that help you get better positions in the organic results of search engines. On the other hand, off-page SEO takes into account the external elements, such as links in authoritative sites that point to your website and that match your theme or industry. Within on-page, the most important elements for improving positioning are the title and description of your page. According to Moz, unique titles help search engines understand that your content is unique and valuable and also helps you achieve higher click rates (CTRs). Choose a readable font for your website’s text: All successful publications, whether newspapers, magazines, websites, etc. choose their font deliberately, never randomly. Using an appropriate font design and size will make your readers feel more comfortable and increase the chances that they’ll want to read more. This will generate confidence and increase the opportunities to grow your business. In Forbes, designer Haris Bacic discusses the 10 best fonts in the Google library based on their quality, readability, versatility, and number of styles available. The three best fonts, according to Bacic, are Open Sans, Roboto, and Lato. Regarding the text size, the standard is 16px, but several scientific investigations have verified that larger sizes tend to have better readability with the 24px being the winner. Create digestible content: Nowadays, people have less of an attention span than a fish. According to a study by Microsoft Corp., people often lose concentration after eight seconds because of the effects of an increasingly digitized lifestyle. If you want to prevent website visitors from getting bored, create digestible content that is concise and easy to read. Make sure that your paragraphs are short and eliminate everything that is not essential for getting your message across. The same happens when it comes to showing the products or services you offer. Although it seems that having more variety is better, it is not exactly like that. A study by Patrick Spenner and Karen Freeman published in Harvard Business Review found that the simplicity of the decision is the only driver of the loyalty of buyers. Don’t talk so much about “what” and focus on “why:” When you talk about your products or services on your website, do not limit yourself by only listing their features. Nobody cares about your ergonomic, adjustable and black lumbar support mesh chair. What really matters is that this chair provides hours of comfort and can help eliminate back pain. It’s about finding the benefits of your product, whether emotional or rational and telling your potential customers about it. The content of your website shouldn’t just answer, “what are you selling me?” but also “why should I buy it?” When making a purchase, people decide with their hearts and justify their purchase with their heads. For example, a dental clinic can convert its orthodontic service with transparent aesthetic braces (characteristic) in an orthodontic service with brackets that are unnoticeable (rational benefit). Add emergency items: You’ve probably found a discount or an offer that ended in, say, three days giving you an impulse to buy it immediately as not to lose the deal. Psychologists specializing in behavior affirm that situations of urgency make us suspend deliberate thinking and act quickly. Many times, conversions on a website do not occur because of people deliberate too much, wait too long or simply don’t respond to the calls to action. By increasing the sense of urgency by setting deadlines such as, “until July 15” or “only today,” or mentioning that there are limited stocks of a product, visitors will be more likely to make a purchase. In fact, it’s not even necessary to change the offer every time the period ends. You can keep the same offer all year and change the dates or the stock quantity each month. Now you know how to start creating your website with the best CMS and what elements it should have to gain visibility in search engines, attract potential customers and get conversions. As you can see, creating a profitable professional website is not an exclusively technical process—psychology plays a very important role. So, to sell more through your website, you must first know your target audience in order to offer them an attractive shopping experience adapted to their needs. If you’ve already set up your website and want to know how to get it to the top of Google’s results, don’t miss this article about how to rank higher on Google.